A new bank branch opened in downtown Paterson this week to serve retail customers and small businesses. 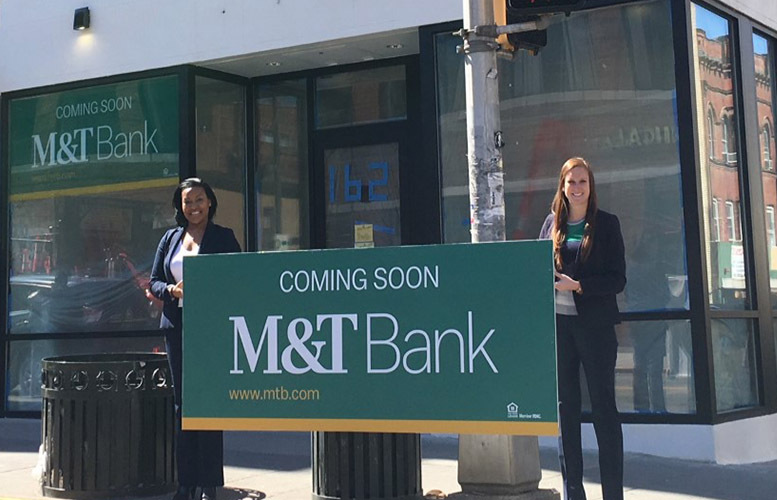 M&T Bank opened its first branch in Paterson on Monday. Its branch at 162 Main Street is its fifth in Passaic County. “We embrace the opportunity to be a part of the Paterson community and look forward to lending to small businesses, while also helping Paterson residents with their personal banking and financial planning goals,” Noel Carroll, senior vice president for M&T Bank in New Jersey, said. Office hours for the branch are 9 a.m. to 4 p.m. Monday through Thursday; 9 a.m. to 6 p.m. on Friday; and 9 a.m. to 1 p.m. on Saturday. A vestibule with an ATM machine will open for customers 24 hours a day. M&T Bank will celebrate its expansion to Paterson by working with Jersey Cares to provide volunteers for a full day of building maintenance and volunteer care at School 20 on June 1, 2018. The new branch will be run by branch manager Tifani Borel (pictured, left, with administrative vice president for retail banking Mallory Boron, right) and her team of five employees. M&T Bank was established in 1856. The bank has more than 90 branches in New Jersey. It is headquartered out of Buffalo, NY.